Pots and pots of green plants were lined in the dirty snow, certain to die of the cold; ivy, canna, a tomato plant. And in a basket I saw a straightening comb, switches of false hair, a curling iron, a card with silvery letters against a background of dark red velvet, reading "God Bless Our Home"; and scattered across the top of a chiffonier were nuggets of High John the Conqueror, the lucky stone; and as I watched the white men put down a basket in which I saw a whiskey bottle filled with rock candy and camphor, a small Ethiopian flag, a faded tintype of Abraham Lincoln, and the smiling image of a Hollywood star torn from a magazine. And on a pillow several badly cracked pieces of delicate china, a commemorative plate celebrating the St. Louis World's Fair . . . I stood in a kind of daze, looking at an old folded lace fan studded with jet and mother-of-pearl. Thinking about this passage made me remember the invitation I've scanned here, which I bought for fifty cents at a flea market a few years ago. Who might have saved this card for so many years? A husband and wife who met at this dance? A printer (note that it's a union printer) who liked to hold on to copies of his work? Someone who liked the lyrics on the back? I thought it appropriate to give this invitation a home. By 1900, Bohemian immigration into the Lawndale-Crawford area replaced the earlier settlers of Dutch, German, Irish, and Scotch extraction. Within a few years, the community was considered the largest Bohemian settlement, outside of Prague, Czechoslovakia. This ethnic group was very politically and socially active throughout the 1920s, 1930s, and 1940s, which resulted in the formation of numerous civic and social organizations as well as a close-knit community. As the area continued to develop, the population shifted, and the Bohemians began to move further west and northwest. They were replaced by various other ethnic groups such as the Poles, and finally the Hispanics, who still reside in the area today. Google Maps shows a large building still standing at 2300 Millard Avenue. It seems to now be home to one or two churches: New Life Christian Church and/or La Villita Community Church. 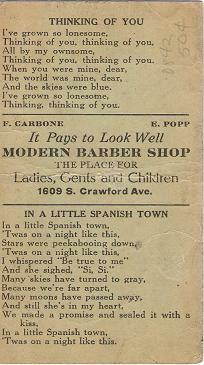 The songs: "In a Little Spanish Town," music by Mabel Wayne, lyrics by Sam M. Lewis and Joe Young, appeared in 1926. "Thinking of You," music by Harry Ruby, lyrics by Bert Kalmar, was featured in the 1927 show The Five O'Clock Girl. ("'FIVE O'CLOCK GIRL' IS HIGHLY ENJOYABLE" said the New York Times on October 11, 1927. "Thinking of You" isn't mentioned in the review.) 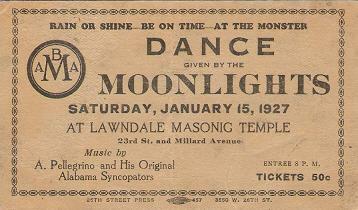 Were people dancing to one or both songs on January 15, 1927? And about the barbers: The only Chicago "F. Carbone" listed in the Social Security Death Index is Frank Carbone (1910-1980), too young to be the man on the card. 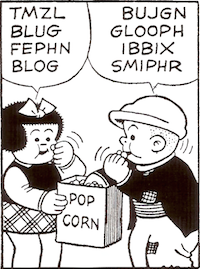 I wonder if "E. Popp" might be Edward (1879-1965), Ernest (1902-1971), or Edwin (1906-1973) (the last almost certainly too young). The address where Messrs. Carbone and Popp had their shop seems to no longer exist. Update, February 2012: Here is a 1925 photograph of Anthony Pellegrino and the Alabama Syncopators. People who think about hacking their lives and their work often speak of "granularity." It's a curious word. The online Oxford English Dictionary offers only “granular condition or quality” as a definition. A more helpful definition comes from the National Center for Supercomputing Applications: "The extent to which a larger entity is subdivided. For example, a yard broken into inches has finer granularity than a yard broken into feet." To think of tasks and challenges in terms of granularity is to think in terms of breaking them down into smaller and more manageable parts. Granularity is a tremendously useful strategy for students. The typical spiral-bound student-planner doesn't encourage it; that tool is often little more than a place to store due dates: "research paper due." But no one can just write a research paper. That paper can only be the result of numerous small-scale tasks. It's not surprising that students who think of "write research paper" as one monolithic task are likely to put it off far longer than they ought to. Instead of "write research paper," one could think of these tasks: go to library to look up sources; organize them by call number; read first three sources and take notes; get article from JSTOR; read remaining three sources and take notes; organize notes on computer; check bibliography format; ask professor about endnote form; make rough outline; and so on. Each of these "granular" tasks is far more do-able than "write research paper." Thinking of work in terms of granularity can be one way to overcome the overwhelming dread of getting started. And keeping track of such tasks on paper and crossing them off one by one gives the satisfaction of making progress and getting closer to done. A student might also apply the strategy of granularity to the work of writing itself. Instead of writing a draft and "looking it over," it's much smarter to break down the work of writing and editing by thinking about one thing at a time. Developing a strong thesis statement: that's one task. Working out a sequence of paragraphs to develop that thesis: another task. Figuring out how to make a transition from one paragraph to another: another task. If you tend to have patterns of errors in your writing, look for each kind of error, one at a time. Noun-pronoun agreement? Read a draft once through looking only for that. Comma splices? Read once through with your eyes on the commas. It might seem that approaching the work of writing and editing in terms of smaller, separate tasks is unnecessarily cumbersome, but breaking things down will likely make it far easier to work more effectively and come out with a stronger piece of writing. No writer can think about everything at once. Granularity is also a useful strategy for making even a daunting reading project do-able. If you have eighty pages to read, finish twenty and take a short break; then repeat. If you're reading James Joyce or Marcel Proust, a handful of pages might be all that you can manage at one sitting, and sometimes you'll chart your progress by the sentence. But those sentences and pages add up. I just finished Proust’s In Search of Lost Time (À la recherche du temps perdu), averaging twenty pages a day over five months and two days of reading (total: 3,102 pages). Try thinking of your next major (or even minor) assignment in terms of granularity. You might find that getting started and making progress come far more easily. 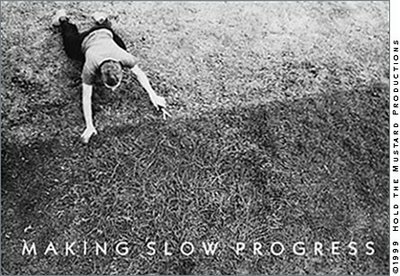 Not long after my wife Elaine and I met, we discovered that we each owned a postcard with the above image: "Making Slow Progress." I'm happy to see that this postcard is still available from Hold the Mustard Photo Cards. Chad Troutwine, an entrepreneur in Malibu, Calif., was negotiating a commercial lease earlier this year for a building he owns in the Midwest. Though talks began well, they soon grew rocky. The telltale sign that things had truly devolved? The sign-offs on the e-mail exchanges with his prospective tenant. "As negotiations started to break down, the sign-offs started to get decidedly shorter and cooler," Mr. Troutwine recalled. "In the beginning it was like, 'I look forward to speaking with you soon' and 'Warmest regards,' and by the end it was just 'Best.'" The deal was eventually completed, but Mr. Troutwine still felt as if he had been snubbed. What’s in an e-mail sign-off? A lot, apparently. Those final few words above your name are where relationships and hierarchies are established, and where what is written in the body of the message can be clarified or undermined. In the days before electronic communication, the formalities of a letter, either business or personal, were taught to every third-grader; sign-offs -- from “Sincerely” to “Yours truly” to “Love” -- came to mind without much effort. But e-mail is a casual medium, and its conventions are scarcely a decade old. They are still evolving, often awkwardly. The Troutwine scenario seems tricky. If negotiations are breaking down, wouldn't "Warmest regards" likely sound snotty and sarcastic? And given the frequency with which e-mails fly back and forth, wouldn't even the best-intentioned correspondents soon weary of such repetition? I'm with Jason Kottke: I think that "Best" is entirely appropriate and courteous when writing to someone other than a friend or relation. "Best wishes" is good too. "Best regards" also seems appropriate. ("Regards" though sounds a bit remote.) "All the best" has long seemed strange to me, probably because I have a book signed by William S. Burroughs that wishes me exactly that. "Thanks" works well if you've made a request. Any variation on "See you next week" is always fine. "Cheers," which is fairly widespread in academia, seems to strike people as either perfectly all right or perfectly pretentious, so perhaps it's best avoided. It's fascinating to watch the conventions of e-mail evolve. For now, I look forward to developing our acquaintance in the posts that follow. CNN reports that "as many as 9 out of [sic] 10 e-mails" are now spam. My academic e-mail address ("harvested," like a still-useful organ, from the university's website) brings at least 70 or 80 spam mails a day (probably 7 or 8 of every 10 messages). Some are automatically marked for deletion. Others, I have to look at. Before deleting those (unopened), I sometimes take strange pleasure in noticing the names under which these messages are sent. I especially like the combination of an over-the-top fake name (made, I assume, by randomly joining names and nouns) and a routine subject line. Laverne Askew, Dooley Eustace, Dionysius Godsey, Pansy Langston, Petronella Naumann, Wiley Q. Patricia, Snow V. Pius, and Patty Potts. who might be a distant relation of Rufus T. Firefly. The images of college life found in collegiate promotional materials offer an abiding version of the pastoral in our world. Therein it's always spring; a small group of shepherds and shepherdesses (i.e., students) sit on the grass. There is always grass. The grass is lush and green, so it must have rained, but not so recently as to make the ground unpleasant to sit upon. (Hey, it's pastoral.) The students are speaking to one another, not into cell phones. They may well be speaking in iambic pentameter and rhyme. ¹ This last sentence is a tip of the hat to William Empson's critical study Some Versions of Pastoral (1935). An ambitious international project to decipher 1,000-year-old moldy pages is yielding new clues about ancient Greece as seen through the eyes of Hyperides, an important Athenian orator and politician from the fourth century B.C. What is slowly coming to light, scholars say, represents the most significant discovery of Hyperides text since 1891, illuminating some fascinating, time-shrouded insights into Athenian law and social history. "This helps to fill in critical moments in ancient classical Greece," said William Noel, the curator of manuscripts and rare books at the Walters Art Museum here and the director of the Archimedes Palimpsest project. Hyperides "is one of the great foundational figures of Greek democracy and the golden age of Athenian democracy, the foundational democracy of all democracy." The Archimedes Palimpsest, sold at auction at Christie's for $2 million in 1998, is best known for containing some of the oldest copies of work by the great Greek mathematician who gives the manuscript its name. But there is more to the palimpsest than Archimedes' work, including 10 pages of Hyperides, offering tantalizing and fresh insights into the critical battle of Salamis in 480 B.C., in which the Greeks defeated the Persians, and the battle of Chaeronea in 338 B.C., which spelled the beginning of the end of Greek democracy. The palimpsest is believed to have been created by Byzantine monks in the 13th century, probably in Constantinople. As was the practice then, the durable and valuable vellum pages of several older texts were washed and scraped, to remove their writing, and then used for a medieval prayer book. The pages of the older books became the sheaths of a newer one, thus a palimpsest (which is pronounced PAL-imp-sest and is Greek for "rubbed again"). 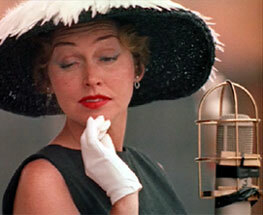 Anita O'Day died yesterday in Los Angeles. I finished reading In Search of Lost Time last night, five months and two days after I started. The final volume, titled Finding Time Again in the Penguin translation, took me only six days, during which I began to have the awful thought that if "anything" were to "happen to me" (that odd euphemism), it could happen before I had finished reading Proust. I had to keep reading! How strange then to find that as In Search of Lost Time nears its end, the work's still-unnamed narrator, after finally coming to understand his vocation as a writer, fears that something might happen to him before he is able to finish his work. 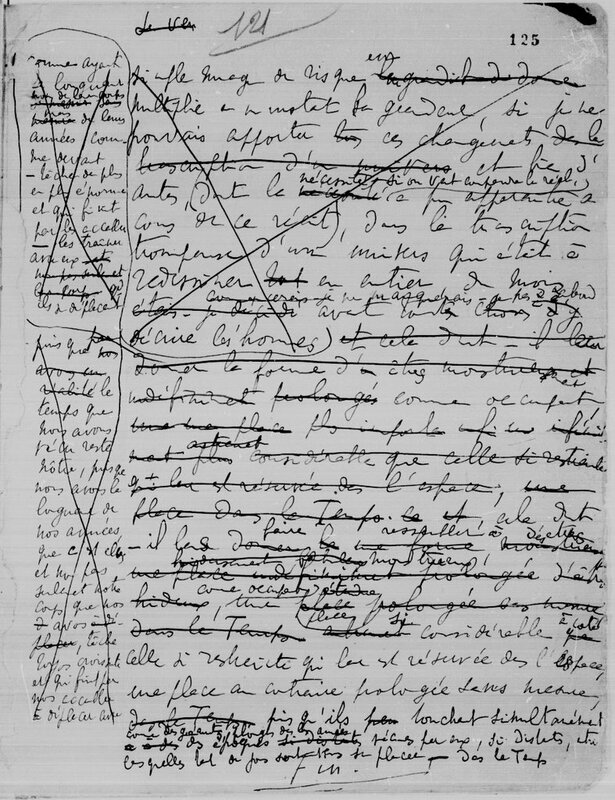 I finished reading Proust for the first time: that's what I should've written above. I plan to go back, soon. Before I do, I want to read Pleasures and Days (sketches and short stories), a volume of letters, Céleste Albaret's memoir Monsieur Proust (CA was Proust's housekeeper), Edmund White's short bio, and Howard Moss' The Magic Lantern of Marcel Proust (a used-book find). And I plan to dip, at least, into the large biographies, Gilles Deleuze's Proust and Signs, and, of course, the French text and the earlier translations. And I'm wondering whether I want to read Alain de Botton's How Proust Can Change Your Life. He already has. How much better life seemed to me now that it seemed susceptible of being illuminated, taken out of the shadows, restored from our ceaseless falsification of it to the truth of what it was, in short, realized in a book! How happy the writer of a book like that would be, I thought, what a labour awaited him! 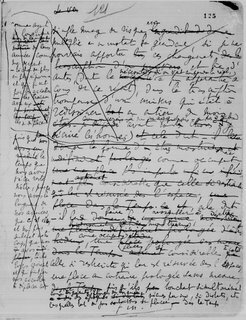 To give some idea of it, one would have to go to the most elevated and divergent arts for comparisons; for this writer, who would also need to show the contrasting aspects of each character to create depth, would have to prepare his book scrupulously, perpetually regrouping his forces as in an offensive, and putting up with the work like tiredness, accepting it like a rule, constructing it like a church, following it like a regime, overcoming it like an obstacle, winning it like a friendship, feeding it up like a child, creating it like a world, without ever neglecting its mysteries, the explanations for which are probably to be found only in other worlds, while our occasional inklings of them are what, in life and in art, move us most deeply. In books of this scope, there are parts which have never had time to be more than sketched in and which will probably never be finished because of the very extent of the architect's plan. Think how many great cathedrals have been left unfinished! One feeds a book like that, one strengthens its weak parts, one looks after it, but eventually it grows up, it marks our tomb, and protects it from rumours and, for a time, from oblivion. But to return to myself, I was thinking about my book in more modest terms, and it would even be a mistake to say that I was thinking of those who would read it as my readers. For they were not, as I saw it, my readers, so much as readers of their own selves, my book being merely one of those magnifying glasses of the sort the optician at Combray used to offer his customers; my book, but a book thanks to which I would be providing them with the means of reading within themselves. With the result that I would not ask them to praise me or to denigrate me, only to tell me if it was right, if the words they were reading in themselves were really the ones I had written (possible divergences in this regard not necessarily always originating, it should be said, in my having been wrong, but sometimes in the fact that the reader's eyes might not be of a type for which my book was suitable as an aid for self-reading). "He said, 'I'm the reason you're gonna be able to buy that cheaper now.'" Doubtless, objects present man with no more than a limited number of their immeasurable attributes, because of the poverty of our senses. Things are coloured because we have eyes; how many other epithets might they not deserve if we had hundreds of senses? But this different aspect that they could have had is made easier for us to understand by what in life is a minimal incident of which we know only a part, believing it to be the whole, and which someone else perceives as if through a window on the other side of the house giving a different view. Only (?) 342 pages of In Search of Lost Time to go. My son Ben and I were playing music -- Sufjan Stevens' "Jacksonville" (Ben, banjo; I, guitar). "Your hands move the same way when you play," Elaine said. "We each have an opposable thumb," I said. As part of the session on improving classroom discussion, participants were asked to imagine what their teaching philosophy would look like if it were the vanity plate for their car. We were allowed 12 letters with which to represent ourselves. For five minutes, people silently scribbled on -- or, like myself, hostilely stared at -- the sheets of paper that had been given to us for this little exercise. When the person sitting next to me (who was similarly not writing anything down) asked why I wasn't participating, I explained that this was exactly the sort of activity I loathed as a student, that I found such activities useless and annoying. Two other people at my table sighed with relief and nodded their heads in agreement. It seems I'm not the only one with little patience for "out of the box" exercises (so many of which turn out to be recycled from the same irritating, warm-and-fuzzy, "I'm pretending this activity is original even though it's completely derivative" edutainment box). Read the whole piece and find out what Bennett wrote for his license plate. "Couldn't I look at her for a moment? I have dreamed of this all my life." "Yes, but don't take too long, Madam, for she will soon have finished dining. But why should she interest you so?" "Because it was Mme de Villeparisis, the Duchesse d'Havré by her first marriage, as beautiful as an angel but as wicked as a witch, who drove my father mad, ruined him, then left him forthwith. And yet! Although she acted like a common whore and caused me and my family to live in straitened circumstances in Combray, now that my father is dead, I console myself with the thought that he loved the most beautiful woman of his day, and since I have never seen her, despite everything it will be a relief . . ."
I led Mme Sazerat, who was trembling with emotion, to the restaurant and pointed out Mme de Villeparisis. But, like the blind, who direct their eyes everywhere but where they should, Mme Sazerat failed to focus her gaze on Mme de Villeparisis's dinner-table, and sought out another corner of the room. "Well, she must have left, I can't see her where you say." And she continued to hunt for the detestable, adorable vision that had haunted her imagination for so long. "No she hasn't, she's at the second table." "We must be starting our count from different ends. At what I call the second table there's only an old gentleman sitting beside a horrid little old lady with a red face and a hunchback." But the problem with readers, the idea we're given of reading is that the model of a reader is the person watching a film, or watching television. So the greatest principle is, "I should sit here and I should be entertained." And the more classical model, which has been completely taken away, is the idea of a reader as an amateur musician. An amateur musician who sits at the piano, has a piece of music, which is the work, made by somebody they don't know, who they probably couldn't comprehend entirely, and they have to use their skills to play this piece of music. The greater the skill, the greater the gift that you give the artist and that the artist gives you. That's the incredibly unfashionable idea of reading. And yet when you practice reading, and you work at a text, it can only give you what you put into it. It's an old moral, but it's completely true. "I was asked by a reporter, 'Is there a Rumsfeld in the Iliad?' I said, 'I don't think so, but isn't one enough?'" Fagles said. "He laughed and didn't print it." You've never given me a good omen yet. Doom, don't you? Not a single favorable omen ever! A reader interested in exploring broad parallels between Homer's world of war and our own should investigate Jonathan Shay's Achilles in Vietnam: Combat Trauma and the Undoing of Character and Odysseus in America: Combat Trauma and the Trials of Homecoming. The first World War ended on November 11, 1918. Armistice Day was observed the next year. In 1954, Armistice Day became Veterans Day. November 11th 1918 will always be remembered by yours truly. We moved out at 4:00 AM in a heavy mist and marched about 4 km. At 9:30 there was a terrific German barrage. I sure thought it was all up. At 10:45 the order came to cease firing. Rumors started to spread that it was the end and I am sure I was not the only one to utter a prayer that it was true. Then, 11 o'clock, and a dead silence! That was absolutely the happiest moment of my life. The PBS site for War Letters (an episode from the documentary series American Experience) includes a transcript with the text of this letter and many others. We fall in love with a smile, the look in someone's eyes, a shoulder. That is enough; then during the long hours of hope or sadness, we create a person, we compose a character. "It's not just like a fall day; it is a fall day!" The Carbondale attorney said he wasn’t running as a "spoiler" candidate but as a viable alternative to Blagojevich and Topinka. "You cannot spoil something that is already rotten," Whitney told reporters during a stop in Springfield. Rich Whitney is the Illinois Green Party's candidate for governor. Removing the thought balloon from the final panel removes Garfield's lame quip -- "You'd think staplers would come with a manual." (No, you wouldn't; Jon's just a klutz.) And without the thought balloon, it's not as clear what's happened to Jon, especially as his staple is no longer very recognizable as such. And "THUD," along with Garfield's impassive stare, is a sufficient punchline. Thus the strip becomes funny and surreal and even tragic -- Jon stumbling about, Garfield enduring, like Shakespeare's Gloucester and Lear, or Beckett's Vladimir and Estragon. O agony! O Garfield! "It's not a 'show' show." [W]e can find everything in our memory: it is a kind of pharmacy or chemical laboratory, where one's hand may fall at any moment on a sedative drug or a dangerous poison. Reality is the cleverest of our enemies. It directs its attacks at those points in our heart where we were not expecting them, and where we had prepared no defense. its triple tongue flickering through its fangs. A few details that strike me: Fitzgerald's "sprang" instantly makes Pyrrhus a figure of frightening energy. "Writhes into the light" has an eerie beauty but seems at odds with the sudden movement of "sprang." Lombardo's Pyrrhus is more a warrior who's ready for his close-up, basking in the spotlight and puffing up with pride. "Venomous and swollen" stands out as choice phrasing. (Here, as in his translations of Homer, Lombardo sets off epic similes with italics.) Fagles' translation is striking in its over-the-top alliteration but sometimes bewildering in its diction. "Prancing in arms" seems unintentionally funny (is Pyrrhus camping it up? ), and "sheath," which might suggest a sheath dress or, alas, a condom (British slang), seems like a very oddly chosen word. Reader, which version(s) do you prefer? The judge took the maliciousness of the crime into account and decided upon a rhadamanthine punishment. In Greek mythology, there were three judges of the underworld: Minos, Aeacus, and Rhadamanthus. Minos, a son of Zeus and Europa, had been the king of Crete before becoming supreme judge in the underworld after his death. Aeacus, another son of Zeus, was king of Aegina before joining the underworld triumvirate. Rhadamanthus, brother of Minos and king of the Cyclades Islands, was especially known for being inflexible when administering his judgment -- hence, the meaning of "rhadamanthine" as "rigorously strict or just."